Given the large number of adults who undergo advanced imaging to help determine the etiology of their back pain, it is important to know the prevalence of imaging findings of degenerative disease in asymptomatic populations. Such information will help both clinical providers and patients interpret the importance of degenerative findings noted in radiology reports. The aim of this study was to systematically review the literature to determine the age-specific prevalence of various imaging findings often associated with degenerative spine disease in asymptomatic individuals. We studied the age-specific prevalence of the following imaging findings in asymptomatic individuals: disk degeneration, disk signal loss, disk height loss, disk bulge, disk protrusion, annular fissures, facet degeneration, and spondylolisthesis. We performed a comprehensive search for articles describing relevant imaging findings by using MEDLINE and EMBASE. To identify studies on imaging of asymptomatic spinal disorders, we searched 3 databases through April 2014 (week 16): Ovid MEDLINE, Ovid EMBASE, and the Web of Science. Ovid MEDLINE and Ovid EMBASE use controlled vocabulary. EMBASE was searched from 1988 to week 16 of 2014, and MEDLINE was searched from 1946 to 2014. The Web of Science is text word–based but tends to be more current and multidisciplinary, so articles may be discovered that are not included in the other databases. The initial concept was spinal diseases or disorders affecting the spine: intervertebral disk degeneration or displacement, spondylolysis, low back pain, or specific vertebrae and joints (eg, lumbar vertebrae). This was combined with diagnostic imaging techniques (tomography, radiography, MR imaging) and the concept by text words of undetected, asymptomatic, and asymptomatic disease (subject heading available in EMBASE, but not MEDLINE). Details of the search strategy are provided in On-line Tables 1 and 2. Studies identified from the literature search were then further evaluated for inclusion in the meta-analysis. We also searched references from multiple articles to find any additional studies that reported lumbar spine CT or MR imaging findings in individuals without low back pain. To be included in our review, a study needed to be published in English and report the prevalence of degenerative findings in different age groups on spine MR imaging or CT in asymptomatic individuals. Asymptomatic individuals were defined as those with no history of back pain. Studies including patients with minor or low-grade back pain were excluded. Studies including patients with motor or sensory symptoms, tumors, or trauma were excluded. If studies did not explicitly state that patients were pain-free, they were excluded. Eleven reviewers (W.B., J.G.J., A.L.A., J.A.T., J.T.W., R.A.D., P.H.L., D.F.K., S.H., L.E.C., and B.W.B.) examined abstracts of studies identified from the literature search to determine whether the articles met the inclusion criteria. For each article that met the inclusion criteria, we used a standard form to abstract imaging technique, age-specific sample sizes, and prevalence rates for the following imaging findings: disk degeneration, disk signal loss (ie, desiccated disk), disk height loss, disk bulge, disk protrusion, annular fissures, facet degeneration, and spondylolisthesis. These entities are defined in detail by the combined task forces of the American Society of Neuroradiology, American Society of Spine Radiology, and North American Spine Society.8 All articles were evaluated by 2 reviewers. 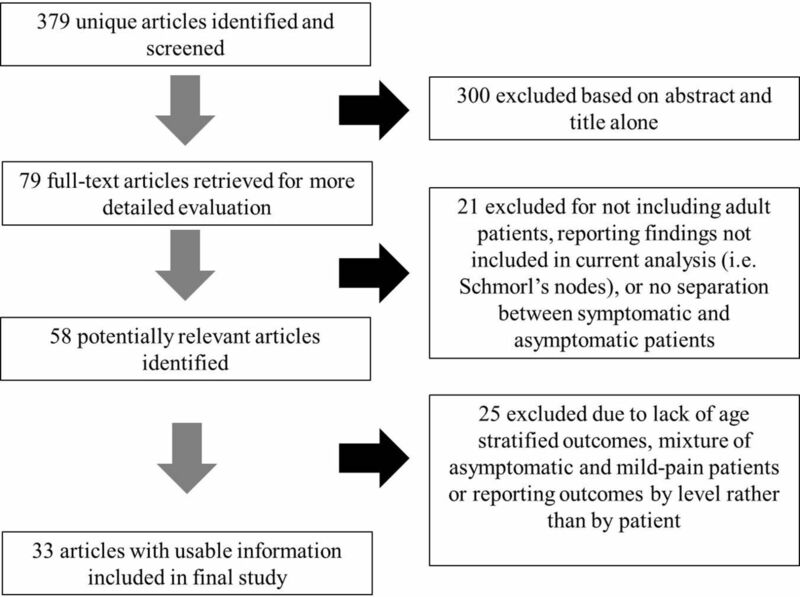 Findings from this systematic review are being used to help physicians with clinical decision-making for patients with low back pain in the Lumbar Imaging With Reporting of Epidemiology: A Pragmatic Cluster Randomized Trial, a multicenter randomized controlled trial aimed at determining whether inserting epidemiologic evidence into lumbar spine imaging reports reduces spine interventions, including further imaging, injections, and surgeries in subsequent years (clinicaltrials.gov identifier NCT02015455). For each age category and finding, the number of studies that contributed information and approximate patient-level sample size was tabulated. For some studies, only the mean (SD) age was provided, and we therefore used a normal approximation to estimate the number of patients in each age category. For each imaging finding, we fit a generalized linear mixed-effects model for the age-specific prevalence estimate (binomial outcome), clustering on study and adjusting for the midpoint of the reported age interval of each study. If a study reported prevalence estimates across multiple age ranges, we included each age-range-specific estimate as a separate record in the analysis. We examined whether the prevalence estimates varied across patient age by decade (20s, 30s, 40s, 50s, 60s, 70s, 80s). In each model, we therefore incorporated knots at ages 40 and 60 in an interaction with the age to allow the association between age and prevalence to differ among age groupings. We tested whether the association between prevalence and age differed by age grouping by using a likelihood ratio test, but we did not observe significant evidence for an interaction and therefore used age as a linear predictor in each model. For each finding, we generated generalized linear mixed-effects model–based prevalence predictions at ages 20, 30, 40, 50, 60, 70, and 80 years. All data analyses were performed by using the R statistics package (Version 3.0.1; http://www.r-project.org). A summary of articles included in the literature review is provided in On-line Table 3. Our search yielded 379 unique articles. On the basis of the abstracts of these articles, we excluded 300 articles that did not meet our review inclusion criteria. Of the remaining 79 articles, we excluded 46 because they did not include asymptomatic individuals or the symptomatic status of patients was ambiguous, did not allow adequate separation of prevalences by age group, or included only patients younger than 18 years of age. Thirty-three studies reporting imaging findings for 3110 individuals met the inclusion criteria for this systematic review. Sample sizes ranged from 8 to 412 individuals. Thirty-two studies reported degenerative changes on MR imaging, and 1 study reported degenerative changes on CT. The search and selection process is summarized in Fig 1. The estimated number of individuals on which each estimate was made is presented in Table 1. We present age-specific prevalence estimates among asymptomatic individuals in Table 2. Disk degeneration prevalence ranged from 37% of asymptomatic individuals 20 years of age to 96% of those 80 years of age, with a large increase in the prevalence through 50 years. Disk signal loss (“black disk”) was similarly present in more than half of individuals older than 40 years of age, and by 60 years, 86% of individuals had disk signal loss. Disk height loss and disk bulge were moderately prevalent among younger individuals, and prevalence estimates for these findings increased steadily by approximately 1% per year. Disk protrusion and annular fissures were moderately prevalent across all age categories but did not substantially increase with age. Authors rarely reported facet degeneration in younger individuals (4%–9% in those 20 and 30 years of age), but the prevalence increased sharply with age. Spondylolisthesis was not commonly found in asymptomatic individuals until 60 years, when prevalence was 23%; prevalence increased substantially at 70 and 80 years of age. This systematic review indicates that many imaging findings of degenerative spine disease have a high prevalence among asymptomatic individuals. All imaging findings examined in this review had an increasing prevalence with increasing age, and some findings (disk degeneration and signal loss) were present in nearly 90% of individuals 60 years of age or older. Our study suggests that imaging findings of degenerative changes such as disk degeneration, disk signal loss, disk height loss, disk protrusion, and facet arthropathy are generally part of the normal aging process rather than pathologic processes requiring intervention. The finding that >50% of asymptomatic individuals 30–39 years of age have disk degeneration, height loss, or bulging suggests that even in young adults, degenerative changes may be incidental and not causally related to presenting symptoms. The results from this systematic review strongly suggest that when degenerative spine findings are incidentally seen (ie, as part of imaging for an indication other than pain or an incidental disk herniation at a level other than where a patient's pain localizes), these findings should be considered as normal age-related changes rather than pathologic processes. MR imaging is highly sensitive in detecting the degenerative changes examined in our study.9 However, even among patients with back pain, prior studies have demonstrated that degenerative findings on MR imaging are not necessarily associated with the degree or the presence of low back pain. Berg et al10 found that a composite MR imaging score taking into account Modic changes, posterior high intensity zones, disk signal changes, and disk height decrease was not correlated with disability or the intensity of low back pain in 170 disk prosthesis candidates. Takatalo et al11 found that disk herniations were strongly associated with low back pain severity among 554 young adults. However, annular fissures, high-intensity zone lesions, Modic changes, and spondylotic defects were not associated with low back pain severity.11 They also demonstrated that disk degeneration was found in one-third of asymptomatic 21-year-olds.11 A systematic review of 12 studies found no consistent association between low back pain and MR imaging findings of Modic changes, disk degeneration, and disk herniation.12 In a large case control study, vertebral endplate changes were not associated with chronic low back pain.13 A number of studies of elite athletes have also demonstrated no association between degenerative changes on MR imaging and the presence or degree of low back pain.14,15 Systematic reviews on the prognostic role of MR imaging findings for outcomes of conservative back pain therapies have failed to find an association between imaging findings and clinical outcomes.16,17 Perhaps most important, the relationship between imaging findings and surgical outcomes has not been well established.18,19 This literature, combined with the results of our study, highlights the importance of caution and of knowledge of the prevalence of imaging findings in similarly aged asymptomatic individuals when interpreting the clinical significance of imaging findings in patients with low back pain. A number of previously published studies have demonstrated the increasing prevalence of degenerative spine findings with increasing age in asymptomatic patients.1,5,20 A cross-sectional study of 975 individuals (symptomatic and asymptomatic) found that the prevalence of an intervertebral disk space with disk degeneration increased from approximately 70% of individuals younger than 50 years of age to >90% of individuals older than 50 years of age.21 These findings are largely consistent with the findings of our study. Some prior studies have failed to demonstrate an association between degenerative spine disease and low back pain.22,23 With a prevalence of degenerative findings of >90% in asymptomatic individuals 60 years of age or older, our study supports the hypothesis that degenerative changes observed on CT and MR imaging are often seen with normal aging. The substantial variation in the prevalence of degenerative findings between age groups of asymptomatic individuals highlights the importance of establishing further diagnostic criteria to help distinguish age-related degenerative changes from pathologic, pain-generating degenerative changes. This study has several limitations. Many of the individuals included in the studies of this systematic review were recruited as volunteers. This recruitment could lead to selection bias because these volunteers are not necessarily representative of the general population. Another limitation is that many studies included in this analysis did not use multiple observers, and it is difficult to ascertain inter- and intraobserver agreement for the presence of these degenerative findings on MR imaging. Recently published studies have demonstrated that even with standardization of nomenclature, interobserver variability is moderate at best.24,25 Furthermore, the studies included in this review span >25 years and did not always use standard nomenclature. Imaging findings were not stratified by the degree of severity. It is possible that asymptomatic individuals have less severe degenerative changes than those with symptoms. Our study does not imply or conclude that the above-mentioned degenerative findings are always age-related rather than pathologic. Our study applies more to cases in which such degenerative findings are incidentally seen in the evaluation of patients without low back pain or findings are found at a level that does not correlate with findings on physical examination. The data on which the systematic review is based may be affected by publication bias.26 Despite the limitations of this study, this systematic review provides useful data to share with clinicians and patients when explaining the clinical significance of degenerative findings seen on advanced imaging. Imaging evidence of degenerative spine disease is common in asymptomatic individuals and increases with age. These findings suggest that many imaging-based degenerative features may be part of normal aging and unassociated with low back pain, especially when incidentally seen. These imaging findings must be interpreted in the context of the patient's clinical condition. Disclosures: Bryan Comstock—RELATED: Grant: National Institutes of Health. * Patrick H. Luetmer—RELATED: Grant: National Institutes of Health. * Brian W. Bresnahan—RELATED: Grant: National Institutes of Health,* Comments: Co-Investigator and institution received federally negotiated F&A compensation; UNRELATED: Grants/Grants Pending: University of Washington, Comments: education and research grants related to radiology, economics, health services research, and comparative effectiveness research as a career and profession, though no other specific grants related to inserting text in radiology reports; previous research grant with GE Healthcare related to risk and benefit assessment for CT imaging, with a focus on radiation-exposure mitigation strategies; Other: I pay United States taxes and Washington state taxes as an employed US citizen, resulting in known and unknown compensation, subsidies, and expenditures. Richard A. Deyo—RELATED: Grant: Agency for Healthcare Research and Quality*; UNRELATED: Board Membership: Informed Medical Decisions Foundation (nonprofit foundation in Boston); Grants/Grants Pending: National Institutes of Health,* Agency for Healthcare Research and Quality,* Patient-Centered Outcomes Research Institute,* Comments: multiple current and pending grants related to back pain research; Royalties: UpToDate, Comments: for authoring topics on low back pain for this on-line reference source. Judith A. Turner—RELATED: Grant: Agency for Healthcare Research and Quality. * Kathryn James—RELATED: Grant: National Institutes of Health*; Support for Travel to Meetings for the Study or Other Purposes: National Institutes of Health,* Comments: The grant supported travel for site visits. David F. Kallmes—RELATED: Grant: National Institutes of Health,* Micrus, Comments: research support for clinical trial; UNRELATED: Grants/Grants Pending: ev3,* NFocus,* Sequent,* MicroVention,* Cook,* ArthroCare,* CareFusion,* Comments: research support; Payment for Development of Educational Presentations: CareFusion,* eV3. * Jeffrey G. Jarvik—RELATED: Grant: National Institutes of Health*; Support for Travel to Meetings for the Study or Other Purposes: National Institutes of Health Health Care Systems Collaboratory meetings; UNRELATED: Board Membership: GE Healthcare CER Advisory Board, Comments: past activity, ended October 2012; Consultancy: HealthHelp (a radiology benefits management company); Grants/Grants Pending: National Institutes of Health,* Agency for Healthcare Research and Quality,* Patient-Centered Outcomes Research Institute*; Patents (planned, pending or issued): PhysiSonics* (an ultrasound-based diagnostic company); Royalties: PhysiSonics*; Stock/Stock Options: PhysiSonics; Travel/Accommodations/Meeting Expenses Unrelated to Activities Listed: GE-Association of University Radiologists Radiology Research Academic Fellowship, Comments: I serve on the academic advisory board. *Money paid to the institution. This work was supported by National Institutes of Health grant UH3 4UH3AR066795-02. Accepted after revision October 3, 2014.